Aside from the requisite waffle iron (the only single-use appliance permitted in my kitchen), all the other items -- flour, baking powder, eggs, etc. -- are kitchen staples. Waffles are fairly easy to make; the only tiny bit of difficulty (and it's not that difficult) is separating the eggs and beating the whites to stiff, but not dry, peaks. until it's uniform in color, below. 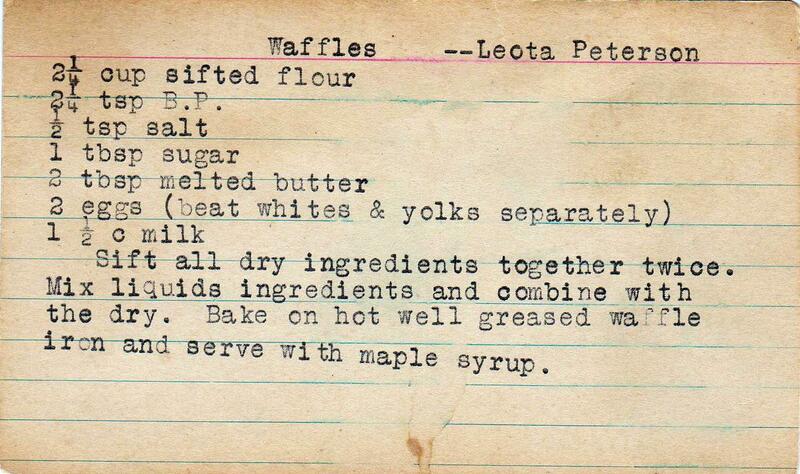 Meantime, heat up your waffle iron and spray it with Pam (or similar). Pour the batter into the iron. Close and after a few minutes, voila! You can end 2012 on a high (and sweet) note. This recipe is from a vintage recipe card signed by Leota Peterson. 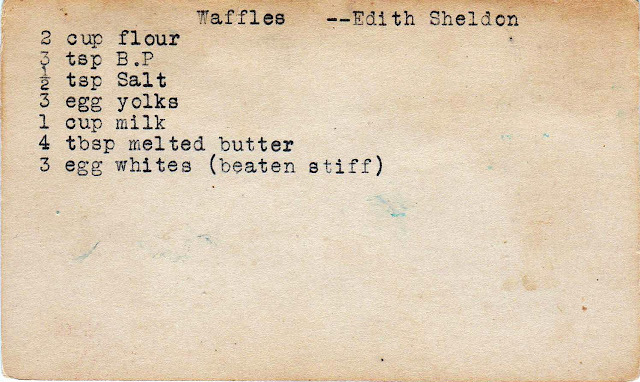 When I was scanning it, I discovered a waffle recipe by Edith Sheldon on the back. Edith's recipe actually looks a bit richer (and better). Well, there will be plenty of time in 2013 to try that, especially after I've fallen off the old diet. Production notes: You need not sift the dry ingredients, just stir them well in a bowl. Add the milk, egg yolk and melted butter and mix. Now, fold in the egg whites. Note Edith's higher butter and egg content, which would result in a richer, eggier (a good thing) tasting waffle. A waffle iron is the only thing keeping me from these. I adore waffles, but abhor single-use appliances. I may have to cave in. Dawn -- If you want homemade waffles, you'll have to give in, but somehow I think you and Tug would be very happy if you do!